Jason O Mahony » Blog Archive » The speech I’d like to see Nick Clegg give. The speech I’d like to see Nick Clegg give. I wrote this in March 2012. Thought it might deserve a little repost. I still think his Sorry speech was worth doing. Most of the people bitching about it will never vote for him anyway. 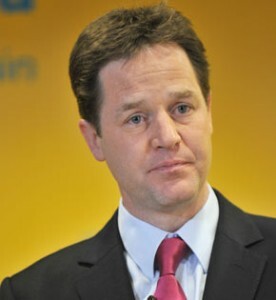 Hello, my name is Nick Clegg, and if some in the media are to be believed, I’m the most hated politician in Britain. I don’t actually know if that is true, but it is certainly fair to say that I’m a lot less popular than I was before the general election. Now, there are many reasons for that. Many people will say that “tuition fees” is the biggest reason, and there’s an element of truth in it, so let’s talk about tuition fees. Before the last general election, I made a promise on tuition fees, and I got a lot of votes from young people and students on the basis of that promise. When I became Deputy Prime Minister I didn’t keep that promise. I could give you loads of reasons why, and argue about the technicalities of college financing, but the reality is that I gave a promise I didn’t keep, and it pissed off a lot of people who trusted me to keep that promise, and many of them will never vote for me or my party again. I can understand why, because they see in me just another politician. The truth is that I was stupid in making that promise in the first place, and that stupidity, giving in to the desire to make a popular statement in public, could well be the most costly political mistake I will ever make in my political career, and could cost me and many of my colleagues our seats. That will be for you to decide. All I can say is that I am sorry, sorry for making the promise in the first place, and as a result, sorry for disappointing so many of you, and if you choose to punish us at the election, I won’t like it, but I will understand it. The issue of actually being in coalition with the Conservatives is another issue which has caused many Liberal Democrat supporters to leave the party. I’m sorry they chose to do that, but I do not apologise for taking this party into government. It is easy to remain in noble opposition, agreeing with the grievances of everybody who is opposed to the government of the day, and never be on the unpopular side of having to actually make a policy work. It is probably true that having not being in government since 1945 meant that many of those attracted to the Lib Dem banner were those with a specific issue or anger towards the government, and many of those now find it difficult to reconcile those grievances with the day to day reality of government. I’m sorry for that too, but I don’t apologise for it. Government is about the power to affect people’s lives for the better, and if you are unwilling to grasp those levers of power because you are afraid that you might not get everything you want, or become unpopular because of that, then you should not be in politics. Today, because of the Liberal Democrats in government, people on lower incomes are paying less tax. Civil liberties taken from us by the Labour regime have been restored. Those on higher incomes are paying a fairer share of tax, and for those who think that we have sold out by entering coalition with David Cameron, let them realise that the alternative is not a pure Lib Dem government, but a Tory majority government that will not give those things the priority we demanded they be given. As for those who look wistfully at the Labour party, and would prefer to see us out of power and Ed Miliband in Downing Street, I have two things to say to you. One, you know where the door is, and two, if you think that Ed Milliband is going to give you what you want, just remember that Ed Miliband never resigned from anything when Labour invaded Iraq with George Bush or stripped civil liberties or gave Rupert Murdoch a de facto seat at the cabinet. Ed and Balls and brother David and all the rest of them were right there in the middle of it, and I guarantee you that this shiny new Citizen Ed will vanish as soon as the door of Number Ten closes. Let me say something about David Cameron. I get on with him, in fact, I like him. There are things we agree on, and things we disagree on, and he comes to the table fighting his corner, and so do I. Occasionally, someone throws an elbow. Vince will even, every now and then, put in the odd knee to the goolies. You know what? That’s good. That’s healthy. That’s called political discourse. You will hear of Tory MPs complaining that we are being rude about them, attacking them about policies they want to pursue. Well, to them I say get used to it. We are in government to answer to the country and our voters, not Tory MPs, and if that means the occasional rough bit of play, the odd shouldering-off-the-ball, so be it. Get used to it. There are many who attack coalition government as some sort of weird perversion of the people’s will. Let me remind you that the British people have not elected a government with a majority of their votes since the 1930s. This government today, when you take the combined poll ratings of the two parties, often gets a higher level of actual voter support than most single party governments won in elections from the 1970s on. But more importantly, a coalition recognises the complex realities of modern life. People negotiate and compromise in their marriages, relationships and in business every single day of the life. Those who believe in the single party our-way-or-no-way government, the “Hyacinth Bucket” approach to marriage, do not recognise that life is just more complex than that. In short, coalition politics is what life looks like. Finally, let me say this: If you think we are not doing enough, you have a choice. You can stay with us, work with us, and give us the leverage to argue and fight and make the Tories compromise. Or you can help the Tories get an overall majority. Or you can put the former Gordon Brown cabinet back into power, doing the things you voted them out for in the first place. They’re not easy options, but as I have learnt to my political cost, the days of me offering you easy, popular solutions are over. Good night.